Detainees held at the US-run Guantanamo Bay detention camp are typically issued one of two uniforms, either a white jumpsuit if the prisoner has been labeled "compliant", or an orange jumpsuit if the detainee has been labeled "non-compliant". When the detainees face Combatant Status Review Tribunals or Administrative Review Board hearings, they were frequently asked to explain their uniforms to the overseeing officer, and they were considered a point in favor of further detaining or releasing the prisoner. Once insurgents began capturing foreigners in Iraq, there was a tendency to dress them in the same orange jumpsuits as their own forces were being dressed in when delivered to Guantanamo Bay – considered by some to be a sign of the insurgents "equating" the captures. 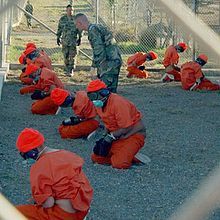 On March 16, 2006, Secretary of State legal adviser John B. Bellinger III gave a digital press conference in which he dismissed the view that all the prisoners were being held in orange jumpsuits, stating "Very few people wear orange jump suits anymore, and yet that is the image that is being left with people all around the world, that everybody in Guantanamo is wearing an orange jump suit." A number of protests against the prison camp have seen activists dress in the iconic orange jumpsuits to draw attention to the issue. In May 2006, a Turkish judge barred Loai al-Saqa, a suspected terrorist, from being brought into his own trial, because he chose to wear an orange jumpsuit for the hearing, demonstrative of his solidarity with those in Guantanamo, and his intentions to protest or resist legal authority. In his testimony during his 2006 Administrative Review Board hearing, Khirullah Khairkhwa described being issued a black uniform when guards (falsely) came to believe he was contemplating suicide. Artist Steve Powers's Animatronic "Waterboarding thrill ride" at Coney Island. Two detainees in white "uniforms" stand in the doorway of their bay in Camp 4. To a certain extent, a detainee's level is determined by where he is housed, as well. Most Level 1 detainees are afforded extra privileges in Camp 4. Detainees walk in an exercise yard in Camp 4, where they live in 10-man bays with nearly all-day access to the yard and other recreational privileges. Detainees sit around the exercise yard in Camp 4, the medium security facility within Camp Delta at Naval Station Guantanamo Bay, Cuba. In Camp 4, highly compliant detainees live in a communal setting and have extensive access to recreation. On June 15, 2008, the McClatchy News Service published a package of articles about Guantanamo. In a profile of Zia Khalid Najib they quoted Abdul Jabar Sabit, Attorney General of Afghanistan. According to their report "...he was struck that detainees were classified into groups, marked in descending order from orange to white garb, by how well they behaved and not by whether they were suspected of terrorist or anti-American activities. ... This division did not have anything to do with the crimes attributed to them. Only their behavior in the prison was taken into account." According to the McClatchy package, some of the detainees with the most meaningful ties to terrorism had been released early, because they were compliant with the camp rules, while low-level or innocent men remained in detention because they had personality clashes with their guards. ^ Rosa Hwang (July 4, 2005). "Inside Guantanamo Bay". CBC News. Retrieved 2008-09-19. ^ Adam Brookes (8 April 2005). "Inside Guantanamo's secret trials". BBC News. Retrieved 2008-09-19. ^ "Detention Controversy". National Geographic. April 2005. Retrieved 2008-09-19. ^ Edward Wong; James Glanz (June 23, 2004). "THE REACH OF WAR: THE INSURGENTS; South Korean Is Killed in Iraq By His Captors". New York Times. In all the recent beheadings, the victims were wearing orange shirts similar to prison jumpsuits. Some analysts have speculated that the jumpsuits are meant to evoke the humiliations of Muslim men at the Abu Ghraib prison and at Guantánamo Bay, Cuba. ^ John B. Bellinger III (March 13, 2006). "Digital Video Press Conference with John B. Bellinger III, Legal Adviser to the Secretary of State". United States Department of State. Archived from the original on September 23, 2006. ^ "The World can't wait -- drive out the Bush regime". Retrieved July 18, 2007. ^ "Guantanamo Bay 5th Anniversary 'Celebrations'". Indymedia. January 11, 2007. Retrieved July 18, 2007. ^ "Five Years of Guantanamo". National Guantanamo Coalition. Retrieved July 18, 2007. ^ "Judge bars 'Guantanamo jumpsuit'". BBC. May 22, 2006. Retrieved 2008-09-19. ^ OARDEC (June 2006). "Summary of Administrative Review Board Proceedings for ISN 579" (PDF). United States Department of Defense. pp. 34–44. Retrieved 2007-10-07. ^ a b Tom Lasseter (June 15, 2008). "Guantanamo Inmate Database: Zia Khalid Najib". Miami Herald. Archived from the original on 2008-06-16. Retrieved 2008-06-16. This page was last edited on 21 October 2018, at 23:18 (UTC).